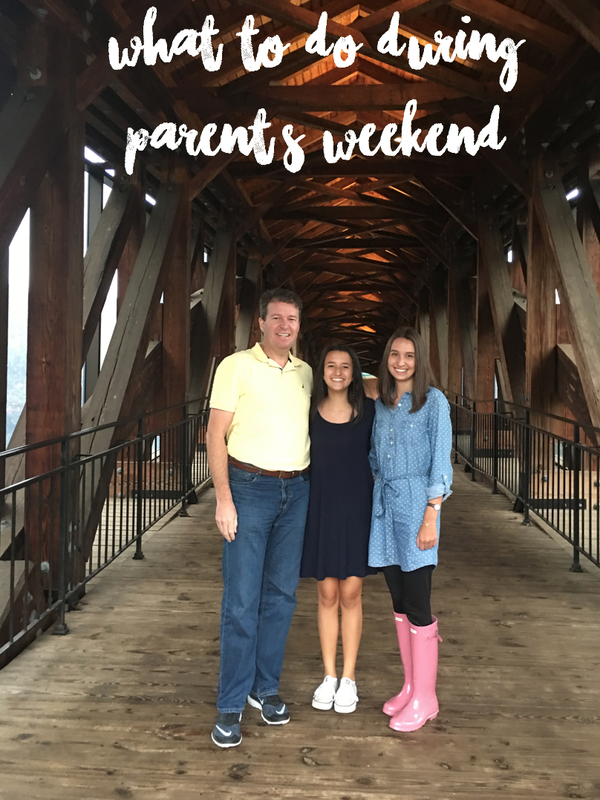 My Well Dressed Life: It's Parent's Weekend: Now What? I remember the first time my parents came to visit me at college, I had no idea what to do with them. I had only been at the school for a couple months and I didn't know where we should eat or what we should do. But now as a sophomore, I have a slightly better idea of what to do when my parents come to town. 1. Plan Restaurants: Have a favorite or maybe want to try out somewhere new, but you're going to need lots of places to eat. Find somewhere cute to eat breakfast and some yummy lunch and dinner spots, nows the best opportunity to eat so much food that did not come from the dining hall so take full advantage of it. 2. Go Shopping: If your a girl there is probably nothing you love more than going shopping with your mom, so show her your favorite shopping spots. But it's also a great time to stock up on all those Target essentials you've been meaning to buy but just haven't. A Target run is a necessary parent's weekend activity. 3. Do Something Outdoorsy: I think this is great especially if the weather is nice. Show them a local park or go on a hike, this will allow your parents to see just how beautiful the area you go to school is. Plus it's a great way to kill a couple hours. 4. Take Part in School Activities: I think it's a great idea to show your parent's what you love about your school, so if there are any school activities take them to them. Plan to go to a sporting event or a talk given on campus, this will show them the many dimensions of your school. 5. Let Them Meet Your Friends: Nothing will give your parents peace of mind like knowing that you have good friends. So introduce them to some of them, if it's official parent's weekend and your friends also have parents in town, go to lunch or dinner together. And if your friends don't have parents in town invite them to come along with you. Another idea is to take your parents on a personalized tour, show them your favorite spots on campus to hang out and to study, let them see the school from your eyes. But also know that when your parents are in town you don't have to spend every second with them if you want some time to do something with friends or to do an assignment they will understand. But they did travel to see you so take advantage of the time you have with them. For any of my fellow college students out there, what is your favorite thing to do with your parents when they come to visit?